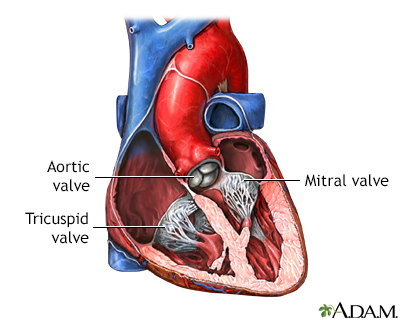 There are four valves in the heart: aortic valve, mitral valve, tricuspid valve, and pulmonary valve. The valves are designed to control the direction of blood flow through the heart. The opening and closing of the heart valves produce the heart-beat sounds. Valve problems may be caused by infections (rheumatic fever) or birth defects and may cause heart failure (congestive heart failure) and infections (infective endocarditis). The surgery is done while the patient is deep-asleep and pain-free (general anesthesia). An incision is made through the breast bone (sternum). Heart valve surgery is open-heart surgery. 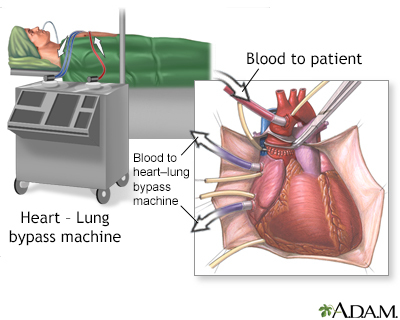 Tubes are used to re-route the blood away from the heart to a heart-lung bypass machine to keep the blood oxygenated and circulating while the heart is being operated on. Valves may be repaired or replaced. Replacement heart valves are either natural (biologic) or artificial (mechanical). 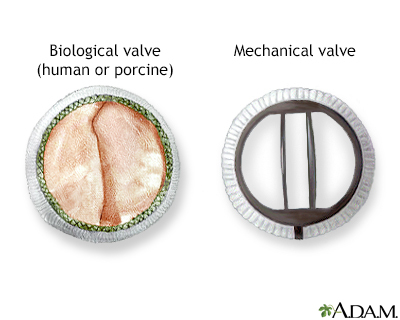 Natural valves are from human donors (cadavers), modified natural valves are from animal donors (porcine: pigs) which are placed in synthetic rings, and artificial valves are made of metal or plastic. Natural valves rarely require life-long medication to prevent blood clot formation (anticoagulation), whereas artificial valves will require anticoagulation. The advantage of mechanical valves is that they last longer-thus, the tradeoff of lifelong anticoagulation in some cases is worth it to avoid a second valve replacement surgery. 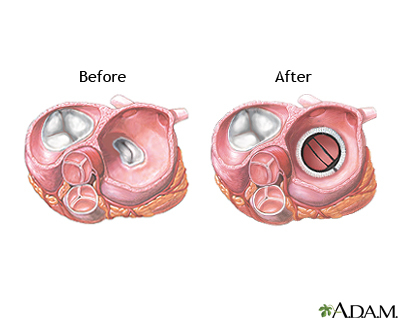 The ineffective mitral valve is removed and the heart valve replacement is sutured into place. The rate of success of heart valve surgery is high and increasing. The operation provides symptom relief and prolongs life. The death rate varies depending on the heart valve and averages 2% to 5%. 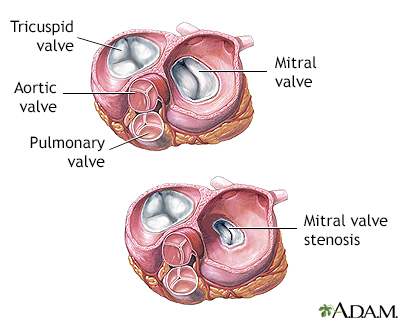 Approximately 2 out of 3 patients who received an artificial mitral valve are still alive 9 years after the surgery. Life-long anticoagulant therapy is necessary for patients with artificial heart valves. 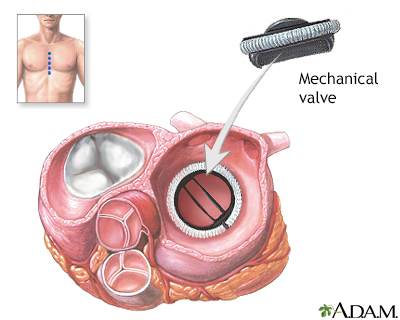 The clicking of the mechanical heart valve may be heard in the chest and is normal. The first 2 or 3 days following the operation are spent in an intensive care unit where heart functions can be monitored constantly. The average hospital stay is 3 weeks. A few weeks to several months should be allowed for complete recovery, depending on health before surgery.